I have a friend who is a lifelong Labour Party supporter. At the next election he is not only intending to vote Labour, he is in fact giving up time, with his family, to leaflet his local constituency and support his local candidate as much as possible. Yet, privately, he admits that he is having to partly hold his nose to do it. Privately, he admits that under a different election system of converting votes into seats, he identifies more with the Green Party. Privately, he admits that the real reason he is voting Labour is more because of his hatred for everything the current Tory party stands for and the fact that the only party in his seat that can unseat the current Tory incumbent is the Labour one. He has spent years disappointed at the lack of courage of a Labour Party that wasted the opportunity given by 3 elections of massive majorities to fundamentally change this the way this country was run towards a more socialist solution. He continues to be fed up that Labour still doesn’t provide a real, proper alternative. Following the speech by Ed Miliband on Saturday to a Labour party rally and the release of a new ‘pledge card’ with five commitments for the next election. I fear my friend will remain disappointed with the Labour Party. For what they have produced are a list of commitments that are populist, unambitious (apart from one), and nothing more than what I would call “Miss World Statements” (all very nice stuff that Miss World candidates say in a contest because no-one can realistically disagree with them). The pledges offer little more than slightly more progressive and slightly more left-wing shifts from what the Tories are currently offering. It’s all about the policies, all about fear of the electorate, and it is no surprise that the Greens and SNP have been so successful in their insistence that they offer the true left-wing, progressive alternative to the Conservatives. Shame, if only politics were better. I have taken the below from the actual Labour Party press release on their website – they are in Italics, my comments below. A STRONG ECONOMIC FOUNDATION: Balance the books and cut the deficit every year while securing the future of the NHS. None of our manifesto commitments require additional borrowing. Yes, this addresses the fear that Labour would increase the country’s debt. They argue that they would cut the deficit, but in a “fairer” way than the Tories. So they would cut less (with few examples of where they would cut) reduce the deficit less on the shoulders of the poorest. The added line about the NHS suggests that the Tories are trying to kill off the NHS, about which there is simply no evidence. But polling obviously suggests a Labour are seen as having an advantage there so in it goes. HIGHER LIVING STANDARDS FOR WORKING FAMILIES: Freeze energy bills until 2017 and give the regulator the power to cut bills this winter, ban exploitative zero-hours contracts, raise the minimum wage to £8 and provide 25 hours free childcare a week. When Ed Miliband announced his politically populist but economically disastrous idea to free energy prices, he actively caused energy prices to be higher. Firms had to go out and fix their costs until 2017, leading them to commit to higher oil prices than the current fall in prices would have given them and to keep their prices high as they wont be able to raise them again should costs (over which they have little control) rise from 2015 to 2017. The advanced profits warnings they have had to release have led to a lack of investment in the future capacity of the country’s energy provision and for Miliband to again say a regulator should force prices down he is just worsening the regulatory environment. Yes, no one should have to make the choice to heat or eat in this country, but price controls are not going to solve this. BUT it is politically populist and many of the electorate won’t understand the above so they are sticking with it. Interesting they are not mentioning bringing down food prices. That’s because they are coming down because of competition from Aldi and Lidl…which shows what can happen if barriers to entry to an industry fall and the government then gets out of the way. The current government has made it easier to switch suppliers and there are now 22 companies in the market…that continuing will make all the difference. They also need to explain what makes an “exploitative” zero hours contract, and how to ban these bits without making the labour market so inflexible that less workers are hired. The rise in the minimum wage will barely cover inflation by 2020 and surely enforcing a living wage would be braver and more effective. We do have a childcare issue in this country, but it will be interesting to see how that massively expensive commitment will be paid for. AN NHS WITH THE TIME TO CARE: 20,000 more nurses and 8,000 more GPs. We will join up services from home to hospital, guaranteeing GP appointments within 48 hours and cancer tests within one week. How do Labour know that the NHS needs that exact number of nurses and GPs? What if they actually need a lot more beds and x-ray machines. This is an expressly statist solution that seems to impose statist targets on an organisation that will know it’s own needs better than any politician. The second half of this begins with the joining up of social care and health care, which is Andy Burnham’s big idea and makes a lot of sense as we have the elderly having to stay in hospital for a long time as there is no joined up funding to provide them with care at home. BUT the Tories are trying this in Manchester and Labour are coming out against it because it isn’t a national solution. I’m not sure their knee-jerk oppositionism is appropriate here. As for the other commitments, are they going to ask GPs to work evenings or weekends or just spend money on more GPs? Can anyone really argue against cancer tests in a week? Ultimately, Labour’s NHS strategy also relies on them spreading the lie about Tory ‘privatisation’ of the NHS when they are simply continuing Labour’s policy of contracting out services where it might provide a better service to the public. To have to rely on a lie may be good politics but shouldn’t be neccessary. 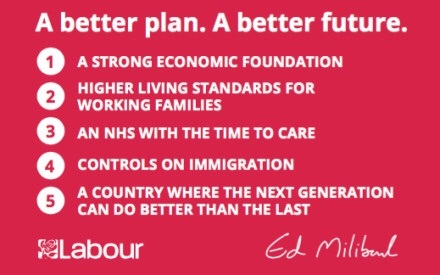 This, unlike education, is an area in which Labour have a proper coherent vision. CONTROLS ON IMMIGRATION: People who come here won’t be able to claim benefits for at least two years and we will introduce fair rules making it illegal for employers to undercut wages by exploiting workers. Years of calling anyone who dared to question uncontrolled immigration as ‘racist’ have caused Labour to put this on their pledge card due to the challenge from UKIP in much of their working class heartland. That this is a half-hearted commitment is exemplified by the fact that the first half is just a copy of a Tory policy, but with the number of years cut in half from four to two. The second half is important, as let’s not forget that the real problem of immigration for many is that the raised supply of labour has pushed down wages for UK workers. But the rules they talk about already exist. It is already illegal to pay less than the minimum wage for instance. So this the policy may sound good but it isn’t really clear how it will change anything. There is nothing wrong in believing that immigration is good for the country, but there does need to be a realisation that we do have some losers from immigration in this country, and they need to be helped. A COUNTRY WHERE THE NEXT GENERATION CAN DO BETTER THAN THE LAST: Tuition fees reduced to £6,000, an apprenticeship for every school leaver who gets the basic grades, and smaller class sizes for 5, 6 & 7 year-olds. I have already made clear my disgust at the lily-livered, regressive and nonsensical cut in tuition fees (and that, if they really believed in it, they would have abolished them). There are literally no ways in which this cut will make universities better nor help make the poor more likely to go to universities. Apprenticeships are vital, and there is an opportunity to make them real ones rather than the current Tory idea of an apprenticeship which is more like a re-badged internal training scheme. Smaller class sizes are one thing (and expensive), but far more important is the quality of teaching. Labour should be far clearer on what they are going to do about that. Now, whilst I have been rather native about these pledges, it is important to understand that I am just as frustrated at the lack of ambition in the Conservative party’s programme. Our political system, involving two parties juking it out in ever-decreasing circles towards the centre. There are now some proper alternative parties, and the main parties seem totally reliant on the election system keeping them in number 10 rather than addressing our country’s issues in a long-term manner. Labour, however, is supposed to be the more radical of the mainstream parties. So it is a shame they are not more radical here. Then maybe people like my friend will be voting Labour for reasons other than they hate the Tories.